In June 2014, Japan's Semiconductor Energy Laboratory (SEL), in collaboration with Nokia, unveiled new foldable OLED display prototypes - 5.9" 1280x720 (249 PPI) ones, which can be folded in two or in three (these were two different prototypes). Last month in Japan SEL unveiled new prototypes. The new panels are bigger at 8.7" and offer a higher resolution (1920x1080, 254 PPI). The new panels are also touch-enabled. And they are still tri-folded like the ones shown in June. The new prototypes use SEL's CAAS-OS (C-Axis Aligned Crystalline Oxide Semiconductor) backplane, and they use a WRGB structure (white OLEDs with color filters). The panels are less than 100?m thick and weigh 6 grams. 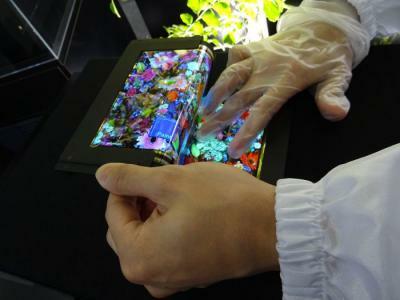 In addition to those large flexible OLEDs, SEL also unveiled new small super-high-resolution AMOLED display. The panel is 2.8" in size and features a resolution of 2560x1440 - or 1,058 PPI. 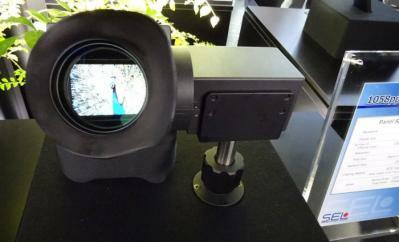 SEL demonstrated this new panel in a large viewfinder application. The 2.8" AMOLED uses the same CAAS-OS backplane and WRGB design. What is the bending radius? What is the bending radius? Is it small enough to make a smartphone, which you can fold up to a tablet? the display showed by SEL ( Japanese Company ) in Display Innovation 2014 held in Yokohama last month, is about 2mm to 4mm radius curvature, it is too enough to equiped a portable device, but the mass production of this foldable type yet fare.